Vision Group (Pvt.) Limited Lahore Punjab. Qualification & Experience: BSc Civil Engineering with 15 years experience in development works relates to road construction, water supply, sewage disposal and buildings. Qualification & Experience: BSc Civil Engineering with 10 years experience in Planning of housing societies and high rise buildings. Qualification & Experience: BSc Civil Engineering with 10 years experience in Multi-storey and high rise buildings. 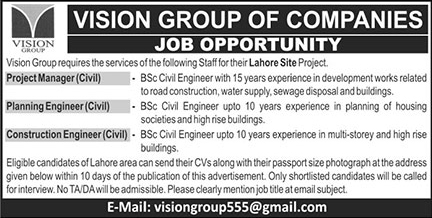 Eligible candidates of Lahore area can send their CVs along with their passport size photographs at the Email address visiongroup555@gmail.com within 10 Days of the Publication of this Advertisement. Please clearly mention job Title at the email subject.